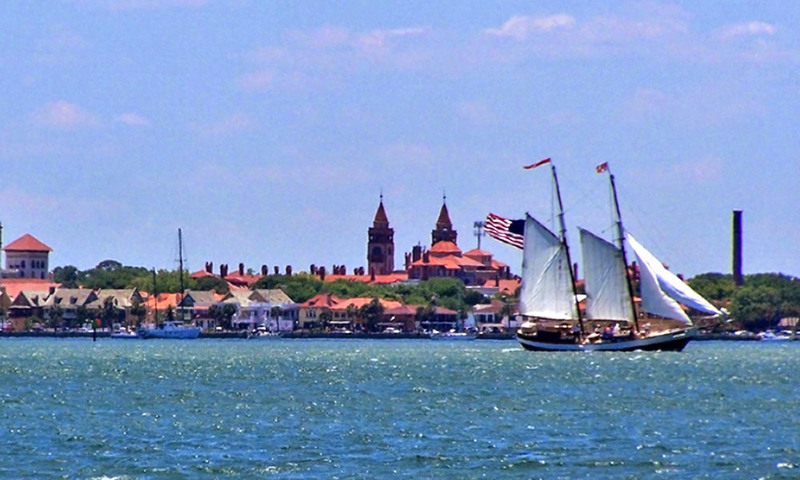 The Schooner Freedom offers St. Augustine visitors the unique opportunity to sail the waters of this historic city aboard a Class B tall ship. An authentic replica of a 19th-century blockade runner, Freedom is a double-masted, gaff-rigged, topsail schooner that was built by naval architect Merritt Walters in 1982 in Norfolk, Virginia. The Freedom was the first sailing tour boat that was certified by the Coast Guard to carry passengers for hire. Freedom was custom-built for use along the Intracoastal Waterway, with a focus on water depth and bridge height to make her perfect for both inland and offshore sailing. Classified as a Class B tall ship with a sparred length of 76 feet, a deck length of 64 feet, and a capacity of 41 passengers, the Schooner Freedom is regularly inspected under the Coast Guard sub-chapter "T" for safety and always sails with one master and two crew members. Freedom's owners, Captain John and Admiral Sarah Zaruba, have been sailing for most of their lives along the eastern U.S. coastal waters from South Carolina to Key West. 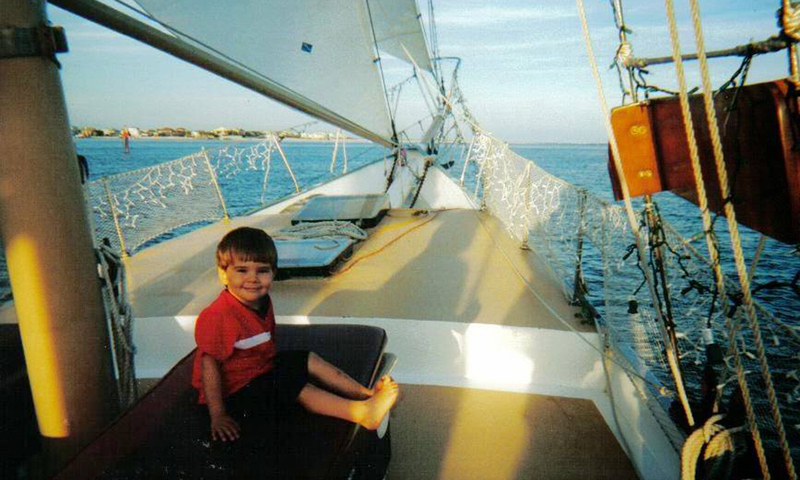 Jon Cook captains the schooner's excursions along with his crew, most of whom are northeast Florida natives. 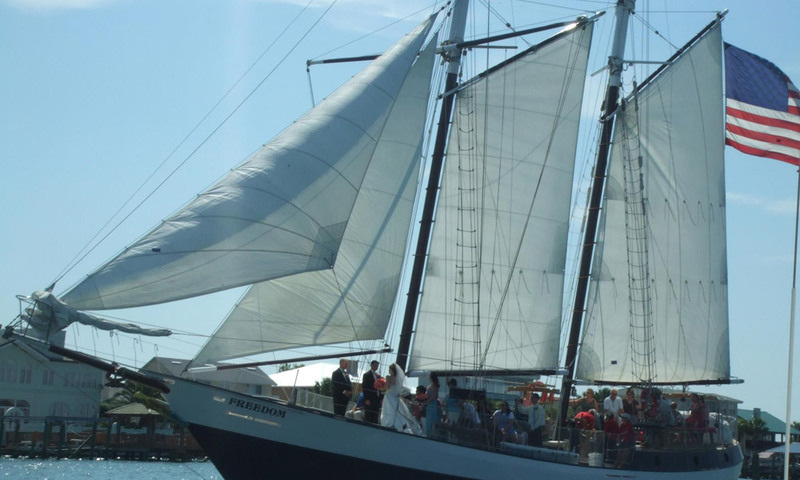 The Schooner Freedom always encourages tour participants who are interested in learning more about sailing to help the crew with hoisting the sails and other shipboard activities. A variety of wildlife can be seen on almost every sail -- everything from gulls, pelicans, and even bald eagles to sea turtles and rays and, of course, to dolphins surfacing nearby. Guests are advised to bring along a jacket or sweatshirt, comfortable shoes, a camera and/or binoculars, sunscreen, and some snacks. The Schooner Freedom begins it 2019 season on Friday, February 8, 2019, with daily sails throughout the peak of sailing season, from mid-March through the end of summer. 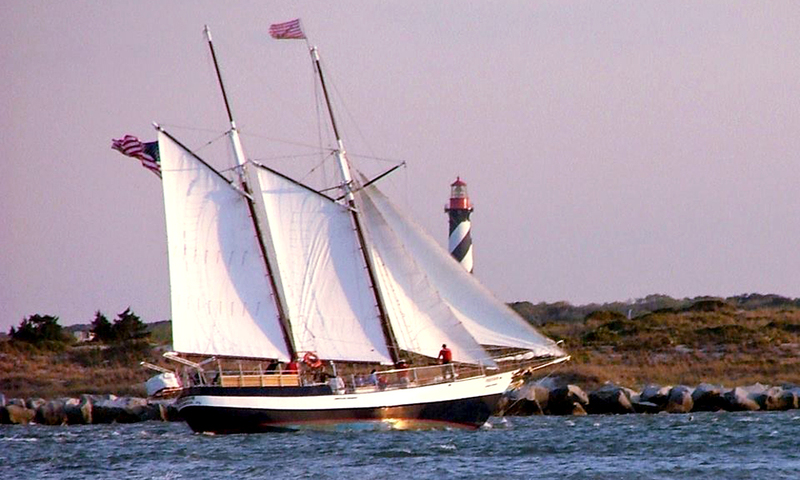 Reservations are required for ALL sails on the Schooner Freedom, which can be made by calling (904) 810-1010. A $5 discount is offered on all sails if paid for in cash. Call (904) 810-1010 to find out when sails are offered and to make a reservation. Day Sail: This two-hour sail departs at 12:15 p.m. daily from February 8 through March 12, 2019, and then at 2:15 p.m. from March 13 through November 2, 2019. $45 for adults and $35 for kids (16 and under) includes complimentary soda, water, beer and wine. Sunset Sail: Guests can enjoy some spectacular sunset views on this two-hour sunset sail. The price is $55 per person, which includes complimentary soda, water, beer and wine. Departure times vary throughout the sailing season. Call (904) 810-1010 for more information. Moonlight Sail: This one-hour sail departs on Fridays and Saturdays during sailing season, weather permitting. $45 per person includes complimentary soda, water, beer and wine. Fins and Freedom Sail: In partnership with Marineland Dolphin Adventure, the Schooner Freedom offers this special two-hour sail each month from March through August 2017. Sail with educators from the world's first "oceanarium" and learn all about dolphins in their natural habitat, as well as the important conservation work going on at Marineland today. The rate of $60 for adults and $45 for kids (16 and under) includes complimentary soda, water, beer and wine on the sail. Also included in the ticket price is admission to Marineland at any point after the sail. This sail is offered in 2019 on March 15, April 19, May 24, June 21, July 19, August 9, and September 6. Full Moon Sail: This sail offers outstanding views of St. Augustine's historic cityscape in the light of the full moon. The Full Moon Sails take place from on the night of the full moon each month: February 19, March 20, April 19, May 18, June 17, July 16, August 15, September 14, October 13, November 12, and December 12, 2019. The rate is $45 per person. Special events and private charters are also offered; please call for more information. Due to the unexpected weather changes that Florida can have, sails can be delayed or sometimes canceled, so guests are advised to book their trips accordingly. We took the 12:15 trip today 3/4/18. It was cold and windy, but the crew provided blankets and jackets. The trip went very smooth, oh yeah and by the way, the crew was wonderful. Highly recommended. Capt John and the crew were great. We live in Saint Augustine and will be back.